Andrea recently volunteered for the Liberty Day Institute. The Institute is a nonprofit organization that works with foundations, community organizations, local businesses, and volunteer attorneys across the country to ensure that all children know and understand our nation’s fundamental rights and founding documents. Each Liberty Day volunteer visits a fifth-grade classroom and discusses one of our fundamental rights and the U.S. Constitution with the students. making process of the justice system by serving on a jury. Andrea had a wonderful visit with the class and enjoyed the chance to spend time with the students and make one of our most fundamental and important constitutional rights more vivid and accessible. 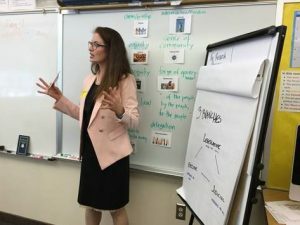 During her time with the class, Andrea provided some important background information and facts about both the right to jury trial and the right to vote, but she most enjoyed leading the students in an activity designed to illustrate how important the right to jury trial is. The students participated in a mock jury exercise and mock legislative exercise to understand the difference on the level of participation that each allows. They were able to experience how being a first-hand decision-maker on a jury is different from having indirect input through representative government in the House of Representatives or the Senate. It was time well spent, and Andrea enjoyed presenting to the fifth-graders and looks forward to returning next year.